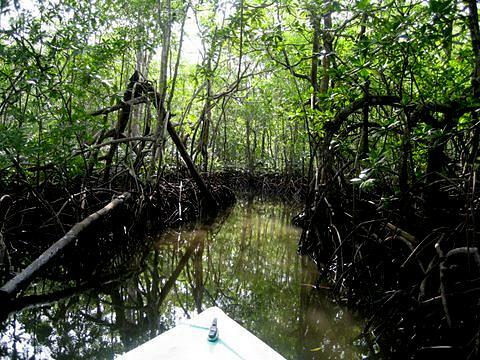 We all agreed the trip we’d been automatically booked to take, a hike through the National Park, wasn’t nearly as promising as a trip up the Sierpe (Serpent) River and into the mangrove swamps. With the incomparable Carlos, the inn manager and our personal guide, “captain” Didier who drove the boat and was also a terrific spotter, and Eduardo, the handsome young architect from San Jose who was moonlighting as assistant manager and official photographer, we had a crew to assure we’d made the right choice. We were probably seven hours on those muddy waters in the motor boat with the blue canvas “roof,” listening to Carlos call out the wonders we were seeing as if he were a carnival barker. “Blue heron,” “blue heron,” he’d say about fifty times making sure we got it until we moved on to the next wonder. Mangrove tree crabs, stick birds, river hyacinths, owl moths, hawks, caymen nestled in the mud so you could hardly see them, crocs floating by like logs or baring their huge teeth on the banks, and on and on until something unexpected happened. Like Didier suddenly slowing the boat and wheeling it around to pursue what he had spotted — like the green parrot snake, a slim green beauty wrapped around a tree limb. Then there was the red mangrove boa, found only in those swamps, and all six or so feet of him sleeping off whatever he’d been up to the night before. Happily.